A month ago I blogged about the unusual difficulties I was having obtaining a photograph of my great-grandparents' tombstones through RAOGK and FindAGrave. Chicagoan, John Frank, of AncestryChronicles contacted me and offered to help when the weather permitted. The weather in Chicago is often the same as it is in St. Louis, magnified. So I understood. I hadn't made the decision myself to return to local cemetery wandering, so I was surprised Saturday to find the photographs were in my email. Both proved how, even when family is pretty good at passing information down, tombstones can reveal small details. died on the 26th of Adar, 5718. This is the first time I've seen her Hebrew names. 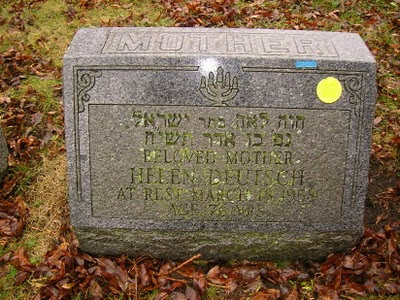 My suspicion is that the name Helen came from the initial letters of both. The blue rectangle says '1930' which is just the lot number, and is only on her stone. 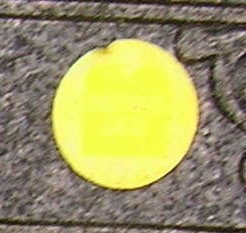 The yellow circle is on both, and I'm not sure of its meaning. Next week: my great grandfather's tombstone provides me with an even greater surprise. Update: I contacted the cemetery, and the yellow sticker represents the type of care the grave is receiving.